What was clear to Dr Lewis from an early age, and what he wrote about often and passionately, was that we are what we think! The nature of the thoughts we allow ourselves to harbour, to a large extent determines our mental and physical health. Irrational thoughts based on unquestioning belief and dark suspicions, harm us more than we realise. The darker, more unfounded and irrational our beliefs are, the more serious the consequences will be for us..., eventually. Our suspicions and beliefs may be entirely unfounded, they may concern facts, figures and people that never even existed, or they may be memories associated with completely unrelated events which though superficially similar to what we seem to remember, are in fact not the actual events we think we remember. But our stubborn belief in them, and our refusal to go the extra mile to get the true facts, acts like a very real poison to our system; and the consequences for us and others can be devastating. Negative thoughts or false beliefs bring about concrete, harmful physiological effects, both in the mind and the body. What may have started out as a seed of irrational doubt, watered and fed by ill will and germinated into a cacophony of confused thoughts and suspicions, soon enough matures into mental hysteria, and finally manifests to us as physiological illness. Mental poisoning is an ever present danger to all who would ignore the need to control their thoughts and the dark suspicions they sometimes harbour. The greatest thing we could do for ourselves is to banish forever all belief in malevolent, supernatural causes to our various mental and physical ailments. 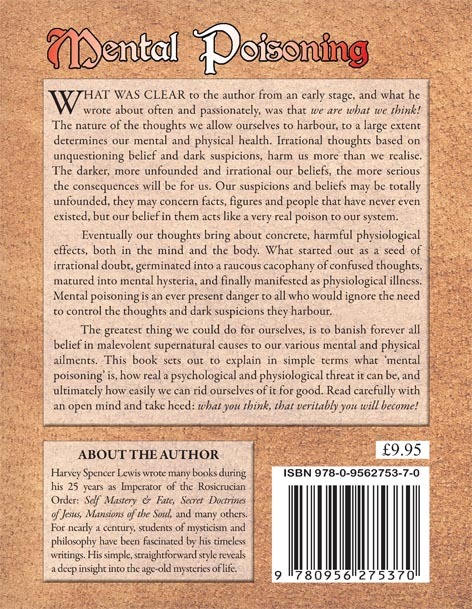 This book sets out to explain in simple terms what ‘mental poisoning’ is, how real a psychological and physiological threat it is, and ultimately how easily we can rid ourselves of it for good. Read carefully with an open mind and take heed: What you think..., that veritably you will become!